FOX CHAPEL – There were audible sighs coming from each of the West Penn Golf Association’s four players who competed in the 54th Williamson Cup matches Tuesday at the Pittsburgh Field Club. Those sighs could have been analyzed a couple different ways. They could have been a result of playing 36 holes in a tough regional competition on a very difficult course set-up in a way that local professional golfers would have been tested. It could have been the sighs were expressions of anticipation for the post-match barbeque and celebration. No, that wasn’t it, either. Those sighs were the expressions of four young men accomplishing something that had never been done previously by a WPGA team. 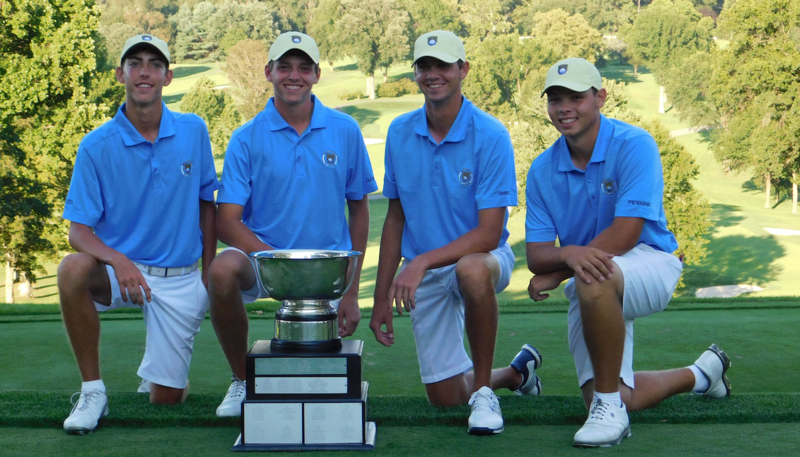 Mark Goetz, Palmer Jackson, Louis Olsakovsky and Brady Pevarnik combined to win the Williamson Cup matches for the first time ever. The WPGA team won by 11 shots over the Golf Association of Philadelphia, 425-436. WPGA took advantage of the home-course edge and was the only team out of 11 in the event to finish under par. Scoring for the Williamson Cup was based on the best three scores of four being used each round for the team total. Jackson, who’ll be a junior at Franklin Regional High School in a couple weeks, received another perk of being the medalist when John Yerger, the co-chairman of the Sunnehanna Amateur championship at Sunnehanna Country Club, announced that the medalist of the WPGA team would get an invitation into the 2018 Amateur. All four players said there had been discussion prior to the start of the matches about the fact they hadn’t won, but none of them said the burden of the streak weighed heavily on them. Pevarnik, who’ll be a junior at Greater Latrobe later this month, offered an interesting perspective. Heady stuff for a team that just won for the first time, but with Pevarnik and Jackson leading next year’s team, the WPGA will definitely be a favorite when the same teams converge at St. Clair Country Club. The local quartet served notice in the morning round when Jackson and Goetz, a soon-to-be freshman at West Virginia University, posted 71s, Olsakovsky 74 and Pevarnik 76. That gave them a 216 total and a four-shot lead. They got even better in the afternoon when WPGA totaled 209 with Jackson and Olsakovsky putting up rounds of 69 and 67, respectively. Goetz had 73 and Pevarnik 74. Olsakovsky, an incoming freshman at Allegheny College, had the shot of the day, holing his second shot from 100 yards on the 418-yard, par-four ninth hole in the afternoon round. He said he hit a half, 54-degree wedge that landed about 10 feet above the cup and spun in. WPGA Executive Director Terry Teasdale was smiling broadly as the afternoon wore on. As the team savored the victory, they took time to show their appreciation for being able to participate in an event like this.